Quinoa, pronounced keen-wah, is a grain-like seed native to South America. Along with corn, quinoa was a food staple for the Incan civilization and has been continuously cultivated for more than 5,000 years. Because quinoa contains all nine essential amino acids, it is a complete protein high in potassium, magnesium, B vitamins and iron. It is also gluten-free, easy to digest and an excellent source of dietary fiber. Although small packages of prepared quinoa are readily available, you can generally find a less costly, organic variety in the bulk bins of your grocery or health food store. Place 1 cup of quinoa into a fine mesh strainer. Rinse under cold, running water until the water runs clear. Drain well. Combine the quinoa with 2 cups of unsweetened coconut milk in a small saucepan. Bring to just below a boil, stir once and reduce the heat to low. Cover the saucepan with a lid, and simmer for 10 minutes or until the liquid is absorbed. Remove the quinoa from the heat, and fluff with a fork. Top with chopped nuts, dried fruits or flaked coconut if desired. If you are using canned coconut milk, you can dilute the contents of one can with enough water to make 2 cups of liquid. Store quinoa in an airtight container in your refrigerator for long-term storage. To boost its nutritional value, cover quinoa seeds with clean water and germinate them in a covered container for three or four hours. Add to salads or sandwiches for a nutritional bonus. For a roasted flavor in your finished dish, toast quinoa in a dry skillet for five minutes before cooking. 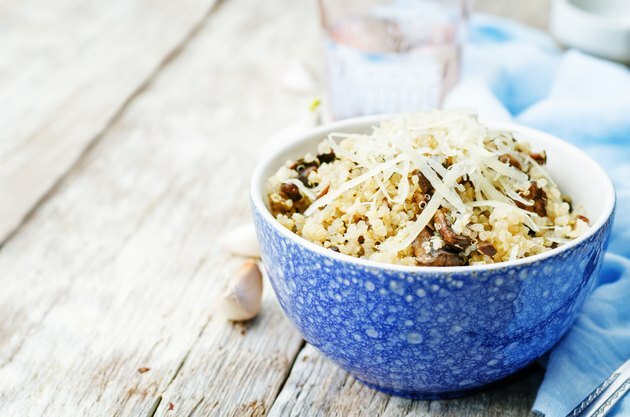 Substitute quinoa for any recipe that calls for rice for a change in pace and an added boost in nutrients. You can use your rice cooker to prepare quinoa. Combine 1 cup of quinoa and 2 cups of water and cook until fluffy – approximately 15 minutes. Plant Foods For Human Nutrition: Nutritional Quality of the Protein in Quinoa (Chenopodium Quinoa, Willd) Seeds.